For years we’ve all be defrosting our cars on wintery morning in the least efficient ways. Removing ice with a plastic scrapper and using de-icer aren’t great ways of getting the job done. What we’re suggesting takes a little bit of preparation the night before but since most of us keep an eye on the weather anyway, that shouldn’t be a problem. Did you realise that using a credit card or anything else that’s not designed for the job will damage the windscreen? Pouring hot water onto your car’s windows will also cause them problems. This sort of unintentional abuse can make your windows more susceptible to cracking. Rather than standing in the cold with a scrapper in your hand and a can of de-icer in the other, be prepared the night before and your commute to work will be loads better. Take a towel and soak it in a solution made up of table salt and water. All you need to do is to place this over your windscreen overnight. If there’s no salt in your house, you can make do as long as you have alcohol. Mixing two parts water with one part alcohol and soaking the towel in that will have the same effect. You can buy a protective cover for your windscreen that works very much the same as the solution we’re suggesting. 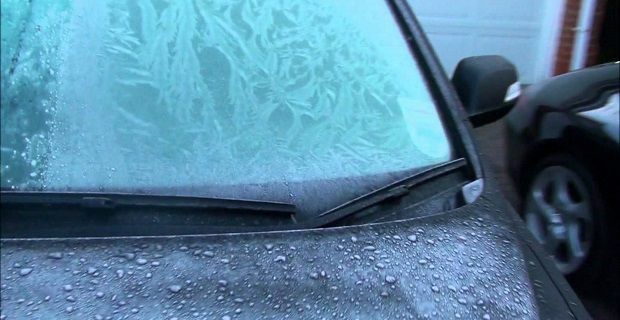 Some motorists suggest using newspapers to protect the windscreen from ice but they’re not waterproof and they fly away easily when it’s windy, so unless you’re expecting a cold but calm night, you should avoid this idea. Click here for more bizarre ideas on how to clear your windscreen.